The California Highway Patrol dedicated a Twitter poem to a driver who left a trail of marijuana trimmings along an Oakland freeway on Thursday. "Roses are red, violets are blue, your spilled weed is green and we have a citation just for you!" the CHP posted. 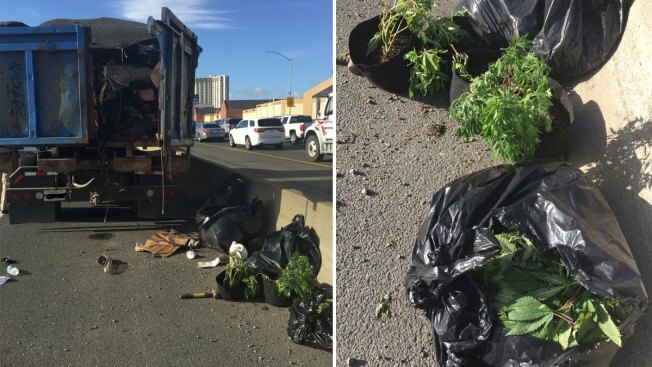 The truck's large bed was piled with bags of marijuana that started falling out because the truck's gate wasn't fastened, CHP Officer Herman Baza said. The spill left a trail at least a mile long, and officers came upon it about 3 p.m. Thursday and followed until finding the source. They stopped the driver on the connector from northbound Interstate Highway 880 to Interstate Highway 580. The marijuana was from a legal business, but the driver was cited for driving without a commercial license, Baza said. No injuries were reported as a result of the spill. Much of the marijuana was cleaned up Baza said, but there was no way of knowing when it first started falling out of the truck, or how much had spilled, Baza said.